Download the App or Sign-Up Online and we'll text you the link! The days of calling for roadside assistance are over. When you need help, Rapitow finds your exact location. One price for total care. Your Rapitow membership covers your car and all its drivers. All roadside assistance costs are covered by your membership. Rapitow™ technology connects you to the closest service provider. Setup your Rapitow™ profile and you will receive a text message with a link to download Rapitow™ onto your Android or iPhone. Your account is setup, now you just need to install the app. That’s it. Rapitow is now installed and when you have car trouble, just tap the app. on your iPhone or Android device and you’re two taps away from getting the help you need from the nearest roadside assistance service provider. Better, Faster and More Affordable Roadside Assistance. and add every driver in your household for free. assistance request to the closest one. then wait for hours for someone to show up. Tap the "Find a Tow" button on your Rapitow™ App. 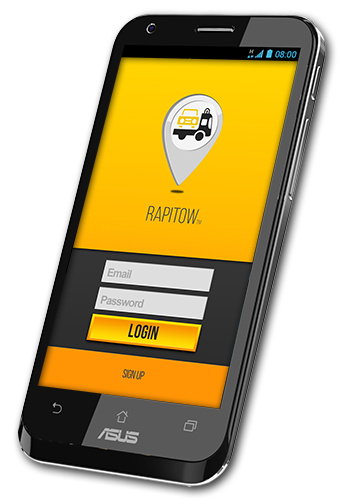 Rapitow™ sends your call information to the closest roadside assistance provider. Sit back and relax, you’re in good hands. You can even track the tow truck on a map.